All Repairs 12 Month/12,000 Mile Warranty! 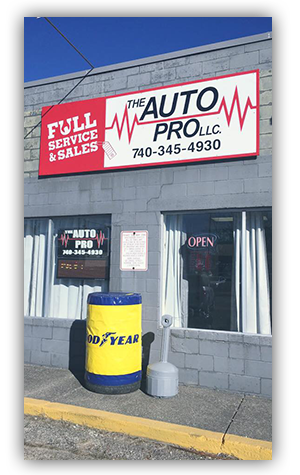 The Auto Pro in Newark, OH is a quality car repair service company that provides the services that you need. The Auto Pro has been serving Licking County, including Mt. Vernon, Buckeye Lake, Heath and Granville since 1998. With experienced workmanship and excellent customer service, you cannot go wrong in giving us a call today. You can make an appointment by calling (740) 345-4930 or by filling out the form below. The Auto Pro of Newark is an option that will help you with your auto needs. Can’t figure out what’s wrong with your vehicle? We can run diagnostics using state-of-the-art equipment to inspect your vehicle. Our team can easily find any problems with your vehicle’s performance and find the best solution to get you back on the road. Count on us to keep your engine in top shape with comprehensive engine repair and maintenance. Whether you need us to change out your spark plugs or repair the electronic control unit, we’ll get the job done right the first time so there’s no hassle when you get back on the road. Does your brake pedal need extra pressure to stop completely? Do your brakes not respond as well as they used to? Bring your vehicle to The Auto Pro for unparalleled brake service. We can exchange your brake fluid, replace brake pads and anything else you need for efficient and fully functioning brakes that will keep you safe on the road. If your vehicle is making a burning smell, loses power on the road or makes clunking and humming sounds, that usually means there’s a problem with the transmission. We offer full service transmission repair and replacement, including transmission fluid exchange, transfer case repairs and so much more. We can adjust your vehicle’s alignment to restore your balance and make your daily commute safer. If your vehicle isn’t getting the power it needs, we can repair any component of your electrical system. Getting preventative maintenance for your vehicle on a regular basis can help you avoid major repairs down the road, saving you time and money. Our preventative maintenance work is comprehensive and takes care of every component of your vehicle so that you’re fully covered. Need tires for your vehicle? We carry a wide selection of tires for every vehicle make and model at a fair price, so you can get the tires you need. You can make an appointment by calling (740) 345-4930. Whether you need to purchase vehicle parts–like tires– or have your present vehicle repaired, The Auto Pro of Newark is an option that will help you with your auto needs. The Auto Pro proudly serves the needs of customers throughout Newark, Mt. Vernon, Heath, Granville, Buckeye Lake and neighboring towns in Licking and surrounding counties.